These three qualities are what we bring to the table for every client, in every case. 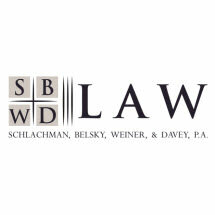 Schlachman, Belsky & Weiner, P.A. (SBW Law) is an AV rated general practice law firm headquartered in downtown Baltimore with branch offices in Easton, Frederick and Upper Marlboro, Maryland. For over 30 years, SBW Law has been committed to righting wrongs for a wide variety of clients and we remain true to this commitment. SBW Law is dedicated to representing people involved in motor vehicle accidents resulting in injury, victims of medical negligence, and persons injured while using defective products. Our years of experience afford us access to vast resources that help ensure that you receive the compensation you deserve. Our team of talented attorneys, paralegals and support staff has worked together to recover millions of dollars in compensation for our clients. We genuinely care about the people we represent.